What Are the Betting Odds on Scottish Independence? Throughout history, political events, especially those revolving around the independence of nations, have been heavily debated in societies across the world. The same can be said about the Scottish independence, which is a political agenda that has been picking up momentum for the last couple of years. Although the Scottish independence has been stealing the media spotlight for only about the last 20 months or so, the debate itself, on whether Scotland should cut off its ties with Great Britain and serve as a free independent sovereign state for its people has been a topic of great interest in the United Kingdom for more than three decades. Everyone seems to have an opinion on the matter, and whenever there is an event which draws polarizing thoughts from people, the bookmakers in the United Kingdom are quick to capitalize on the golden opportunity. Contrary to common belief, betting in the United Kingdom is not only restricted to sports and other amusement activities. Betting can be based on every single aspect of human life as long as it is permitted by the legal authorities in the United Kingdom. 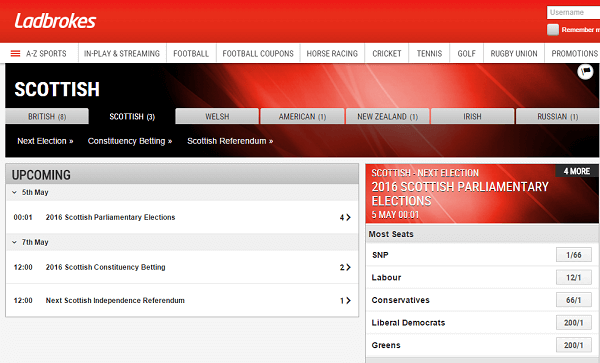 One form of betting that is hugely influential and highly attractive is political betting. The biggest bookmakers in the United Kingdom offer some kind of political betting features to their valued punters or bettors. Political betting in many ways is hugely different from sports betting or any other form of betting that you may be familiar to. Although major political issues, such as the Scottish independence, is relevant and a matter of concern to every individual who identifies himself or herself as British, there are only a few selected people who would have their interests piqued by political betting. Everyone loves to hear news about politics on the radio, on the internet or on their television sets. But every rarely do people engage in political betting. The average British man or woman may spend as much time watching political events unfold on the media as he or she watches football games being covered by the media. However, the inclination towards football betting and political betting is not the same by any stretch of the imagination. If you take the Scottish independence for example, you will realize that not a lot of people are willing to bet on the outcome of any referendums that are staged to come up with a verdict on the Scottish independence. 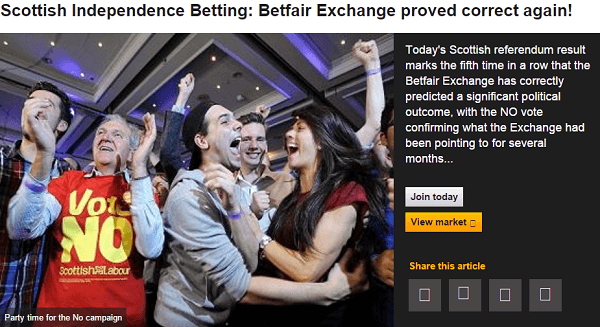 Even punters who actively engage in sports betting may not be aware of the betting odds for Scottish independence. This is because the betting odds of Scottish independence cannot be as easily predicted as the betting odds for a football game or a game of golf. Debates on major political events such as the Scottish independence are based on a foundation of complexities. These complexities can only be understood by those who observe politics more keenly and carefully than the common man. Just watching the news and reading the surveys published on BBC will not suffice. A lot more research has to be done in order to find out what the betting odds are for the Scottish independence. Once you are aware of the betting odds, you will be able to place your bet on the outcome that is most likely to materialize after a referendum. You can even bet on when the referendum will take place. It is a widely known and accepted fact that research is the key to excellence in any form of betting. This statement could not be any truer for political betting. Since each and every single aspect of a political event may not be covered on the news, a bettor or punter interested in political betting has to dig further in order to earth invaluable information that can swing the odds in favour of him or her when placing a bet on a political outcome. In the case of the Scottish independence, one requires thorough knowledge of the political situation between England and Scotland in order to make a more accurate judgement on how things will turn out in events concerning the independence of the latter. 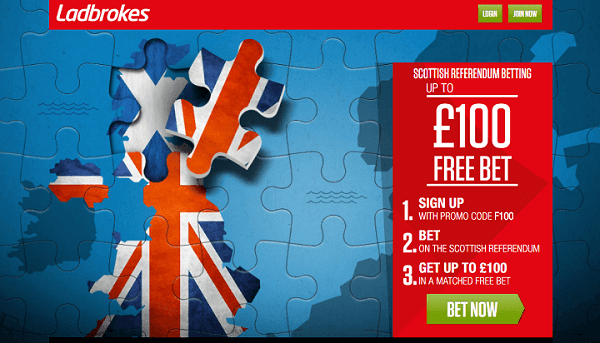 As a person who has never been involved in political betting before, you may be surprised to know that there is a lot of information on the internet regarding betting on the Scottish independence. You may be tempted into thinking that the betting on the Scottish independence is a taboo activity and would not be given attention to by the renowned bookmakers in the United Kingdom, but as mentioned before, some of the major bookmakers in UK are actually given their punters the opportunity to make some incredible money by betting on this mega political debate that has drawn enormous media attention. You will be even more surprised to know that there are different types of bets based on the Scottish independence. Odds on the Scottish independence differ from one bet type to the other. The following are the most popular three kinds of bets that are being placed on matters regarding the Scottish independence. The odds stated below are the ones offered by William Hill Betting, which is one of the most prominent betting operators in the United Kingdom and overseas. Since the conclusion of the referendum in 2014, the main political uncertainty that people are currently betting on is whether there will be another referendum before the year 2020. The odds on this issue concerning the Scottish Independence are 1/6 and 7/2 for “No” and “Yes” respectively. The exact date of the next Scottish referendum is also up for debate. Each political specialist has his or her own view of what year or timeline would be most suitable for the next referendum. The odds on the referendum taking place between the year 2015 to the year 2024 are (4/5). The odds for the 2025 to 2034 time are (9/4). The odds for a date later than 2034 are (5/2). Needless to say, there is a great degree of uncertainty whether the next referendum will produce results in favour of the Scottish independence or against it. The uncertainty is very intense given the fact that the results of the previous referendum were quite “even-steven” in nature. 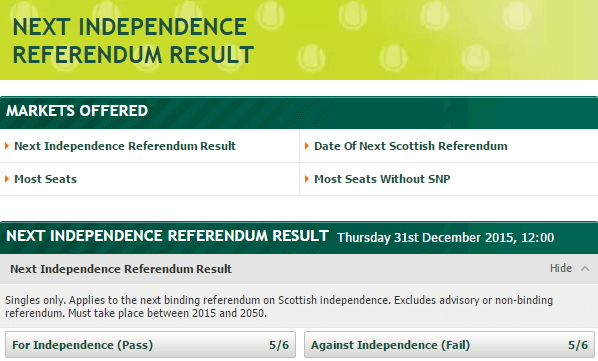 The betting odds for Scottish independence are (10/11) while the betting odds against Scottish independence are (4/5).